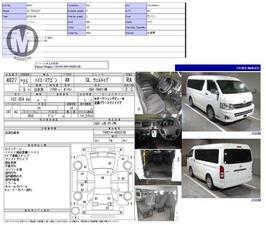 Toyota Hiace Wagon 2013 Model 2700 cc White Colour 102,000 km R Grade Complete Auction Sheet Available, Just Like A Brand New Car. =================================== Merchants Automobile Karachi Branch, We Offer Cars With 100% Original Auction Report Based Cars With Money Back Guarantee. Recommended Tips To Buy Japanese Vehicle: 1. Always Check Auction Report. 2. Verify Auction Report From Someone Else. 3. Ask For Japan Yard Pics If Possible. MAY ALLAH CURSE LIARS..